To meet David Shuey for the first time, I had to run after him, and chase him down. 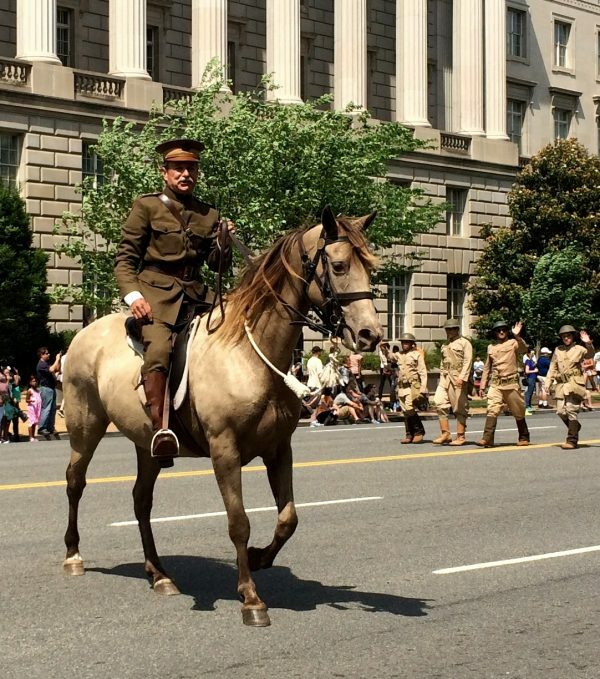 It was the 2014 National Memorial Day Parade in Washington DC, and he was the star. He stole the crowd from marching band leaders, from the celebrities on the floats, and even from the the Grand Marshall. 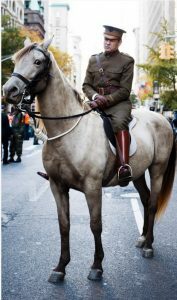 Dave was on his beautiful horse, Aura Lee, dressed out as General Pershing. And he was magical. Unlike the usual down-the-middle parade slugs, Dave was riding — galloping! — from one side of the street to the other, then back, firing up the crowd, with one-liners like “WE’RE GONNA TAKE IT TO THE KAISER!” and “IT’S GREAT TO BE BACK IN AMERICA!”. The people were electrified — screaming and cheering with joy. David Shuey at the New York Veterans Day Parade. This was especially incredible — because it was early in 2014, and World War I was still considered ‘A Forgotten War”. Nobody knew who General Pershing was, or who the Kaiser was. I knew this to be a fact, because I was the brand-new WWI Centennial Commission‘s brand-new Communications guy. The parade managers had lumped the various period reenactor folks together into their various periods. We had mustered forth into the parade modestly that day with a handful of lumpy ‘Doughboys’, along with a restored Packard truck from Pennsylvania, and a restored Model T Ambulance from Texas. Compared to the legion after legion of Civil War guys, and the fleet of sleek 1940’s convertibles carrying the WWII vets, our showing was low-end. My big prayer that morning was that our 100 year-old vehicles would not stall out, and die out on the parade route, embarrassing everybody. Then the parade kicked off. Everybody took their places, and started moving forward. That’s when I noticed the General Pershing guy. Up ahead. He slipped in, right out in front of the rest of the World War I-era players. We turned the corner on to the parade route proper, and General Pershing turned on the charm. His energy infected our entire team — Our Doughboys found their missing rhythm. Our vehicle drivers never let off the Ahhh-Ouuu-Gah horns, never stopped waving, never stopped screaming to the crowd. We gave them a show, a show we did not even know we had. No period-group in the whole parade, that Memorial Day, was more cheered, more embraced, or more remembered afterward, than our little WWI group. Our guys were simply buzzing afterward, as we finally made it to the de-marshalling area. I raced off, one sole thought in my mind. We need that Pershing Guy on our team. But where did he go? The parade’s end was a mob scene. People everywhere. Horse trailers vehicle trailers, marching band buses, kids, cops. I had to find him. I HAD to find him. He was a magician. He found a way to make World War I interesting. Engaging. He could break through. He could shake free that “Forgotten War” label. No war should be forgotten. No veteran should be forgotten. I HAD to find him. Finally, after running ten blocks, crossing and criss-crossing, I finally found him. Aura Lee was in trailered up. Pershing was getting into the cab to drive away. But I found him just in time. And he joined our team. We gave him a few resources, and a few opportunities. Magician that he was, he spun them into gold. 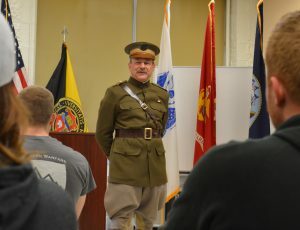 Over the next four years, Dave Shuey performed as the U.S. WWI Centennial Commission’s General Pershing for over fifty events, all across the country. He played in Kansas City at the National WWI Museum & Memorial, Chicago at the Pritzker Military Museum & Library, New York City for the Veterans Day Parade, and for the Camp Doughboy, Baltimore for their living history days, Atlanta, Wisconsin, North Dakota, and on and on. Washington DC — for four more parades, and for a host of major official events, and conventions. We watched steadily, in the coming years, as — with Dave’s great help — the general awareness of World War I topics grew and grew. News coverage increased. 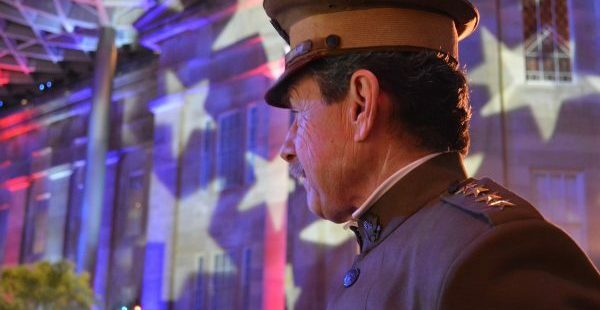 Events like Camp Doughboy at Governors Island and the NYC Veterans Day Parade exploded in participation. 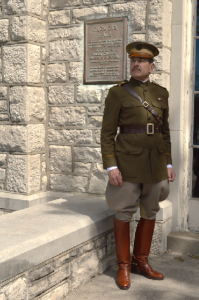 Donations to our WWI Memorial went from a trickle to a steady stream. Now it is in the millions of dollars. Because, in part, of what Dave did for us, because, in part, of what Dave gave us — this war is not going to be forgotten. And those veterans, those men and women who served in that war, are not going to be forgotten. David W. Shuey, age 63, passed away on Monday, September 17, 2018 after a long battle with cancer. Dave’s memorial service will be on Saturday, 20 OCT at the First Presbyterian Church on the Square in Carlisle, PA. A full obituary may be found here. Chris Isleib is Director of Public Affairs, United States World War One Centennial Commission. Contact the author.